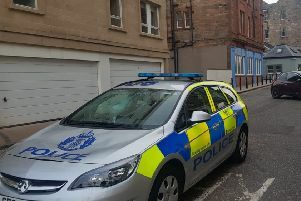 THE victim in an attempted murder case involving a former Hibs footballer has been found dead in a Leith flat. Police said the death of James Martin, 51, was being treated as “unexplained”. But it is not thought to be connected to a December shopping centre attack which left him injured. One possible cause still being investigated by police is understood to be a drugs overdose. A post-mortem examination will be carried out to establish the cause of Mr Martin’s death, to be considered by the procurator fiscal. Previously, Martin suffered injuries to his face, head and body after allegedly being assaulted outside the Newkirkgate shopping centre on December 8. Former Easter Road defender Darren McCormack was charged with trying to kill Mr Martin after he was beaten into a coma. Mr McCormack, 29, was charged with attempted murder and appeared at Edinburgh Sheriff Court in December. His case is still working its way through the courts. Mr Martin is understood to have been released from hospital earlier this year following the December attack. He is understood to have been the partner of Mr McCormack’s sister Terry-Anne. Last year, former under-21 Scotland international Mr McCormack was banned from football for four years after he tested positive for the anabolic steroid, metandienone. He gave a positive sample after a game on April 8 and played his last match for his then club Brechin the following weekend. He was released by the newly-promoted Ladbrokes Championship club in the summer. Mr McCormack started his career with Hibernian and made 24 appearances before playing for Ross County, East Fife and Airdrie ahead of his move to Brechin in 2014. Proceedings against Mr McCormack are understood to be unaffected by Mr Martin’s death, with any future court date still to be confirmed. Anyone with information about the death were being urged to contact Police Scotland on 101.